I think ENI can’t be moved to another **** subnet **** — private IP address of the ENI should be part of subnet IP address range so I think it can’t be moved? Note that you can’t move the elastic network interface to another subnet after it’s created, and you can only attach the interface to instances in the same Availability Zone. Could you please explain me the word: “move” in the above sentence? I am still confused how a secondary private IPv4 can help in case of instance failure. Sure No issues, be very careful reading the question as it is common occurrence in the exam. Answer for Qestion 6 should be B, not C.
If we need to fing INCORRECT sentence – then choose B. The question is checking for the incorrect statement. 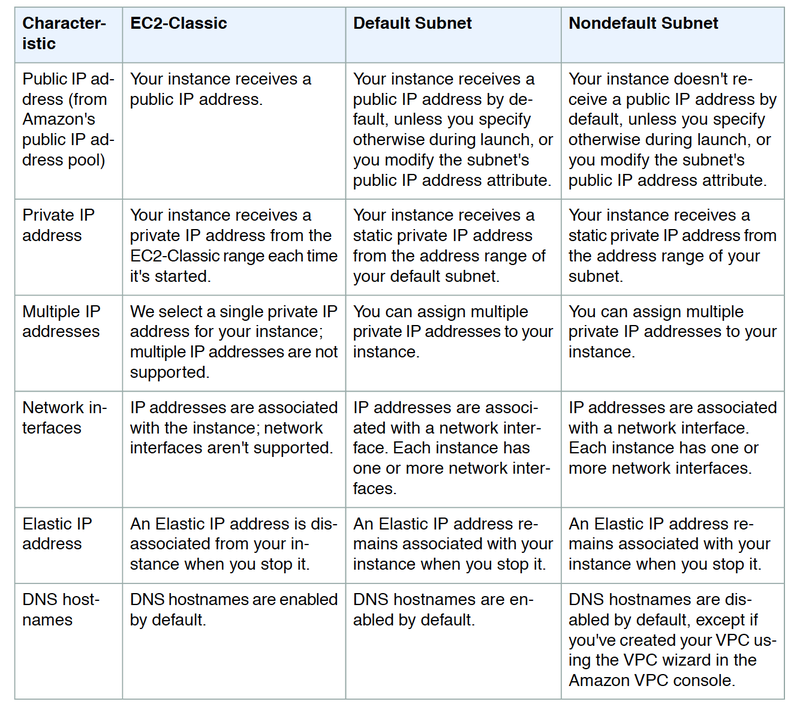 In Amazon VPC, an instance does not retain its private IP addresses when the instance is stopped – is Incorrect as the instance retains its private addresses with the stopped. Even “a” is incorrect as it mentions about private IP address which does not get released when instance is stopped. Only public ip gets released when instance is stopped. The Amazon EC2 here actually means Amazon EC2-Classic which preceded the VPC and is not used anymore. Option A is correct for EC2-Classic. B & D as the application is legacy and needs hard coded IP address, you can use secondary ENI or secondary IP address. Btw.. using your blog, I completed the 3 associate exams. Thanks a LOT for your help. Thats Great … Congrats …. For below question, “c” also seems correct answer. 7. To ensure failover capabilities, consider using a _____ for incoming traffic on a network interface”. secondary private IP. Secondary public IP is not possible. Your blogs are so succinct with so much information! Thank you for writing these! I have a question about ENIs. If ENIs maintain private IPs when detached from an instance and attached to another, how can we have an ENI detached from one subnet and attached to an instance in another subnet in the same AZ and VPC? haven’t tried it yet, but should be easy to test by creating an ENI in subnet and trying to attached it to another instance in different subnet. For question #1 – why “b” is correct not “d”?